Here’s an interesting chain of connectivity. 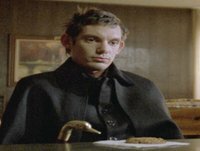 In the odd, rather brilliant teen-noir film Brick, Lukas Haas (left) plays a sinister Tolkein-loving drug kingpin who styles himself after the star of the 1966 vampire soap Dark Shadows, Barnabas Collins (right). Brick’s lead, one Joseph Gordon Levitt, was actually in a short-lived 1990 revival of Dark Shadows. 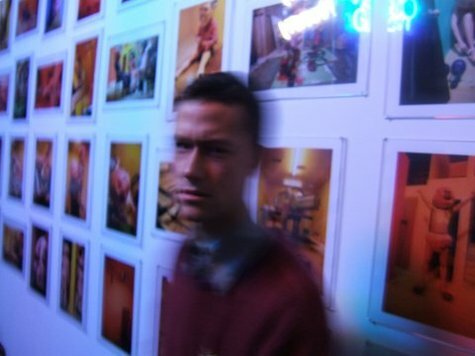 Which provides an excellent opportunity to post this gratuitous shirtless shot of JGL from Mysterious Skin that I found at CyberZine, a site devoted to screen grabs of guys that skews so young you may go to jail just for visiting it. See you in Sing-Sing!